J and I don’t spend as much time in Portage as we used to. When we first moved to Kalamazoo, we lived right off Kilgore, so the shopping district in Portage was a frequent stop for us. Now that we live on the West side of town, trips to Portage are only for stores that we can’t hit on West Main. A couple weeks ago, we were driving down Westnedge and I noticed signage for a new Happy’s Pizza. Last week, I met a friend at Five Guys for lunch and saw that the place was open. The new Happy’s Pizza is on South Westnedge just south of Milham. I’m fairly certain this building used to be a MacKenzie’s Bakery. I don’t actually think there has been anything there since J and I moved here, but for some reason, I remember seeing MacKenzie signs there and a Google search sort of backs that up. 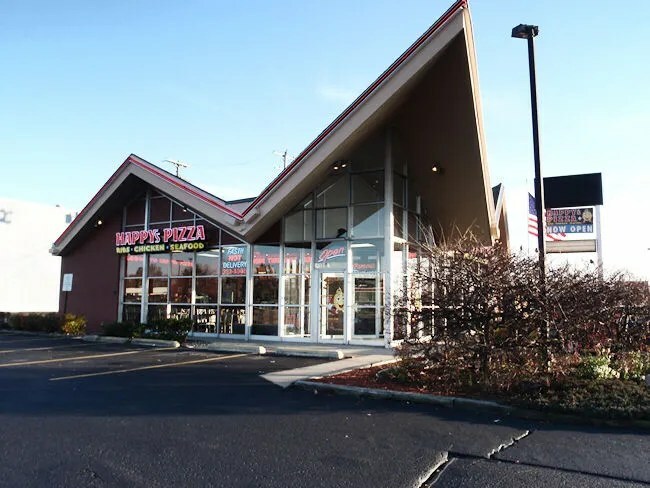 The Portage location is the Kalamazoo area’s second Happy’s Pizza. The first is just a few miles north, also on South Westnedge just south of downtown. Sunday dinner recently has defaulted to pizza night. I was in the mood for pizza Saturday night, but wasn’t able to get out at work to pick anything up. Since I was still in that pizza mood, I asked J if that was ok. She said it was fine as long as I ordered soon. Unfortunately, Happy’s doesn’t do online ordering (at least that I could find on their website), so I actually had to call it in. I chose to go with the Large Square pizza with half plain cheese and half pepperoni. For an extra $.50, the guy taking my order talked me in to the butter Parmesan crust (honestly, he didn’t have to do much arm twisting.) I also got an order of 6 Jumbo Whole Wings. The wings were going to take a little longer to cook, so they gave me a time of about twenty minutes and a price just over $20. I decided to give J a little alone time, so L and I jumped in my truck and headed across town to pick up our dinner. The wings were just being boxed up as I walked in the door. By the time we took care of the bill, one of the cooks was bringing out my two boxes. He saw me with a baby in my arms and offered the carry the boxes out to the truck for me. I tried to tell him I could handle it, but he wouldn’t take no for an answer and I appreciated the help. 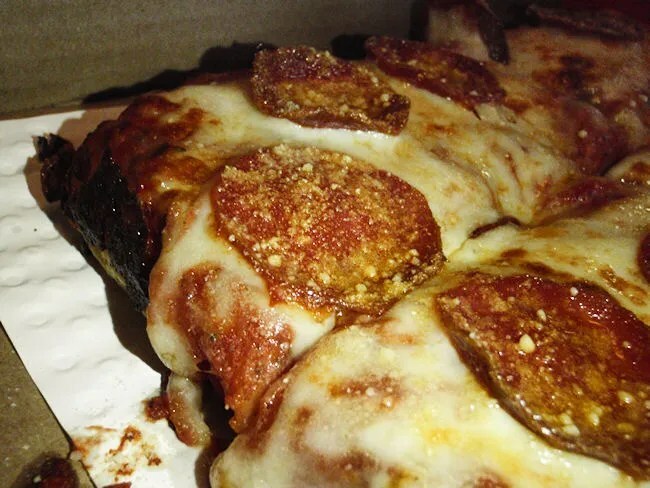 We normally order square pizzas from Jet’s, but we have done Happy’s in the past. It’s actually hard for me to tell you which one is better because I like both. Happy’s has a very crunchy yet soft, buttery crust. The butter Parmesan crust amped up that buttery flavor even more. L really seemed to like it. We normally rip off the crust of a slice of pizza and let her gum it. Since there really isn’t a crust on the square pizzas, J pulled the cheese off of a slice and cut it in half….L ended up eating both halves and wanted more. At the first sitting, I only ate two slices of the pizza. I really wanted the chicken while it was warm. The whole chicken wings are quite large. The crispy wings were very tender and juicy and the meat was falling right off the bone. I ate three of the wings while J had one. 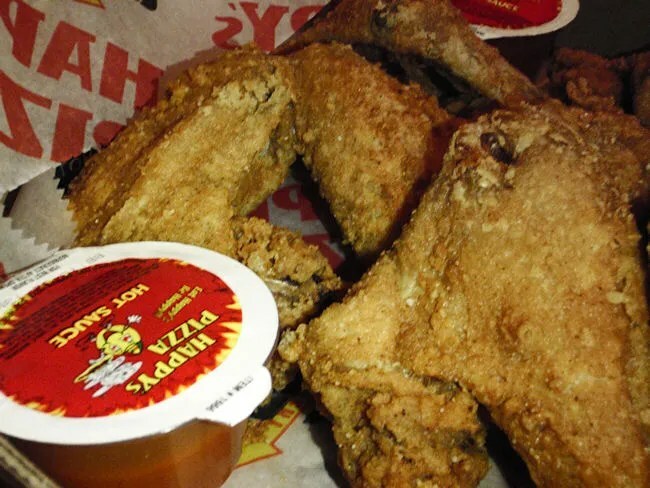 When I went back for my second Happy’s meal later in the evening, I grabbed one of the packets of hot sauce that came with the wings and poured it on a few slices of the cold pizza. The hot sauce is pretty thick and very spicy. I know it was supposed to be used for the wings but it was very tasty on the pizza as well. 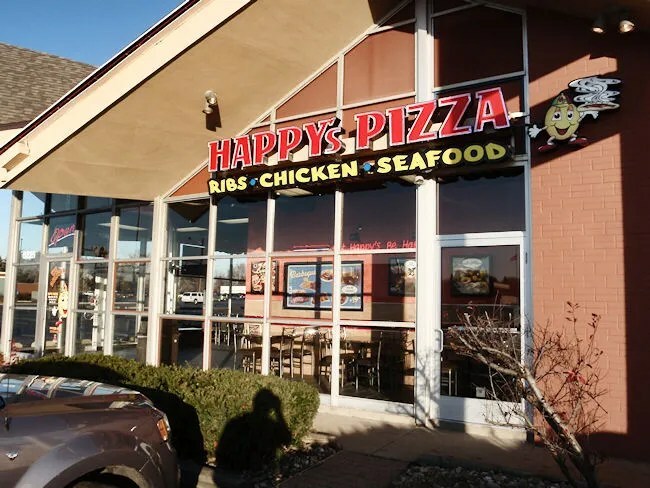 I don’t think we’ve ever had a bad experience at a Happy’s Pizza going back to our days in Lansing when the first Happy’s in that town opened right down the street from our apartment. The odd thing is we’ve never really branched out from the pizza or wings. They have a huge menu with ribs and sandwiches that we never even consider. 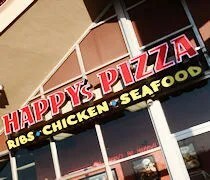 We always think of Happy’s as a pizza place which is a way of thinking we should probably change. The store in Portage actually has a pretty good dining area so stopping in for lunch isn’t out of the question. The other location has online ordering via Grubhub, Campusspecial, and the new Orderkzoo. Their burgers are quite bleh and not fresh-tasting, but the rest of what they have is quite good. I recommend the $5 stuffed cheese bread.